Bharti Airtel, Vodafone India and Reliance Jio are rolling out aggressively-priced prepaid and postpaid plans one after another. The Indian telecom sector is not only battling debts but also intense competition. The ultimate beneficiaries, however, are consumers who are getting spoilt for choice. 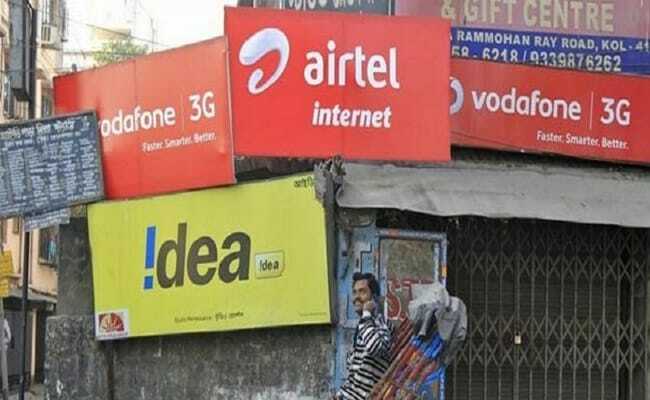 Bharti Airtel, Vodafone India and Reliance Jio are rolling out aggressively-priced prepaid and postpaid plans one after another. The key players of the industry are fighting off the competitive pricing model of Mukesh Ambani-led Reliance Jio, which has been offering high speed data at relatively cheaper rates. However, Jio recently hiked rates of some of its plans. Although analysts welcomed the hikes as a good initial signal of more pricing discipline, they said that Jio's prices are still low, according to a report by news agency Reuters. Under its recharge plan priced at Rs 149, which is valid for 28 days, Jio offers high speed data of 4.2 GBs with a daily limit of 0.15 GB. The speed is reduced to 64 Kbps after the customer exhausts the daily limit. Local and STD voice calls are free and unlimited in this plan but SMS (short message service) is capped at 300 in this plan. This recharge pack by Jio comes with a validity of 49 days. It offers 1GB data per day. After usage of 1GB data per day, the speed is reduced to 64 Kbps. The maximum data that can be availed in this plan is 49GB. Voice calls and SMS are unlimited. Jio's Rs 399 recharge pack comes with a validity of 70 days. 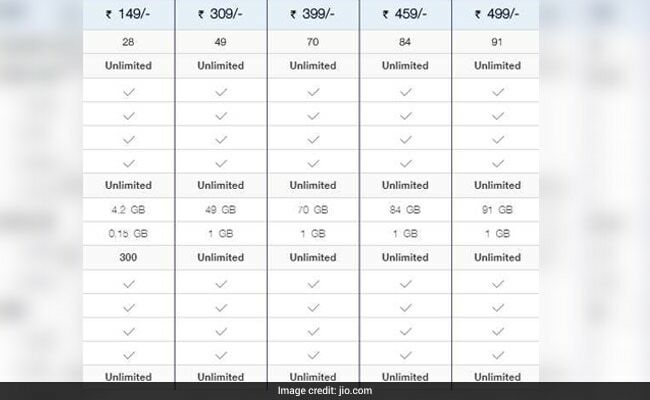 Among other benefits, Jio offers 70 GBs of high speed data with a daily limit of 1GB under its Rs 399 plan. Like other prepaid packs offered by Jio, the data speed is reduced to 64 Kbps after the daily limit, according to the Jio website. Voice calls and SMS are unlimited. For Rs 459, a Jio prepaid customer gets high speed data of 84 GBs over a validity period of 84 days, with a daily usage limit of 1GB. After the daily limit exhaustion, speed will be reduced to 64 Kbps. Voice calls and SMS are unlimited. 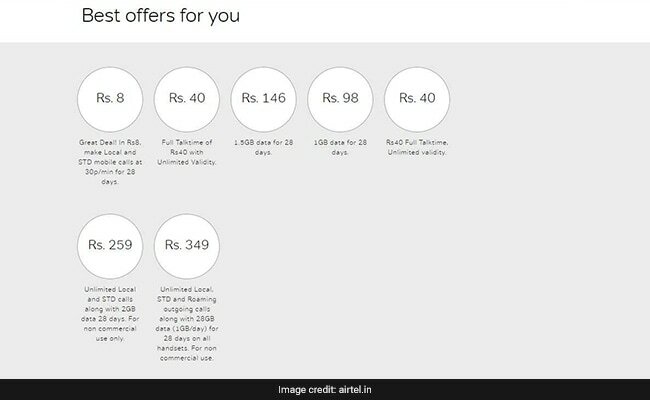 In Rs 499 plan, Jio is offering 1GB data per day subject to a maximum limit of 91GB data for 91 days. Post the usage of daily limit, internet speed will get reduced to 65 Kbps. This plan offers 1.5 GB data for a period of 28 days. This plan offers unlimited local and STD calls along with 2GB data for 28 days. This Airtel plan offers 28GB data subject to 1GB data per day for a period of 28 days. It also carries with it the benefit of unlimited local, STD and roaming outgoing calls. This plan offers 2GB 4G data for 4G handset and 4G SIM or 300 MB data for 4G handsets or 50 MB data for other handsets and SIMs, according to My Vodafone app. Vodafone to Vodafone local and STD calls are unlimited. Vodafone to other operators calls will be charged at 1 paisa per second. All local and national SMSes will be charged at 25 paisa per SMS. The pack is valid for 28 days. Under this plan, one gets 2 GB 4G data for 4G handset and 4G SIM or 300 MB data for a 4G handset or 50 MB data for other handsets for a period of 28 days. 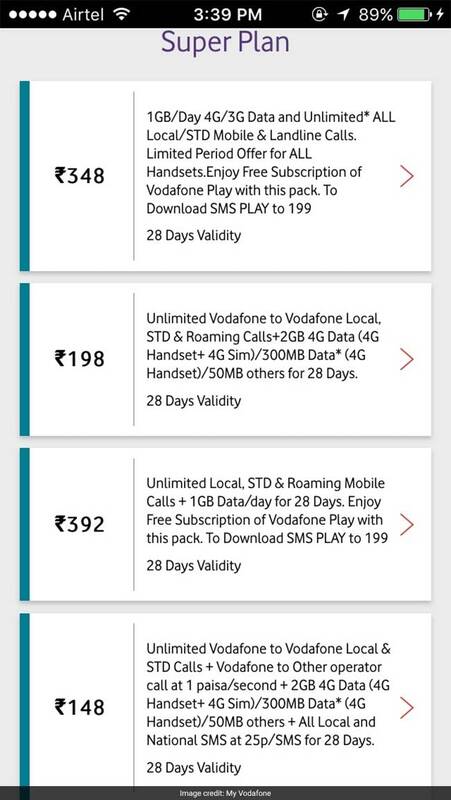 Vodafone to Vodafone local and STD calls as well as calls on roaming are unlimited. This plan offers 1 GB 4G/3G data per day for a validity of 28 days. Local or STD mobile and landline calls are also unlimited. According to My Vodafone app, this is a limited period offer for all handsets. Customers also get free subscription of Vodafone PLAY, the app which streams TV channels and movies. Under this recharge pack, customers get 1 GB data per day for 28 days. Unlimited local, STD and roaming mobile calls are also available. Customers also get free subscription of Vodafone PLAY.